Please note; the shuttle could take up to one hour to arrive for pick up. For bookings under 3 nights stay, let the driver know you are a Maze guest and you can then pay at reception on arrival. If you book direct through our Maze Website www.mazebackpackers.com and are staying for 3 or more nights, we offer a complimentary pickup with Airbus Sydney. Never pay the driver and we will take care of it at reception with the driver. 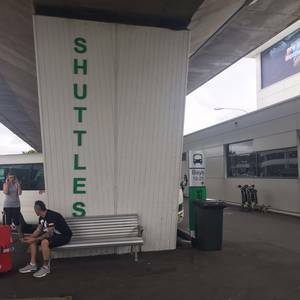 International Terminal – Located outside the terminal, near McDonalds to Meet at Bus and Coach meeting point (Bay 12). Domestic Terminal – Outside at the bus top, between terminal 2 and 3, next to the blue domestic Qantas sign. Alternatively, we recommend using the train to Central Station. Ideally don’t bring a car! There is NO street parking near by. Any parking will be EXPENSIVE. Approx $35 overnight if you ask reception to validate your ticket before you pay.